Urayasu Summer Bon Odori(浦安納涼盆踊り) happens in the middle of August at Urayasu Elementary School. 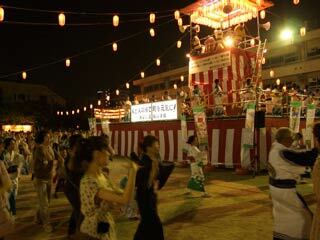 Many Bon Dancer and Matsuri lover visit this matsuri and enjoy Bon Odori. There are many food stands just like typical other Japanese Matsuri. In side the school, you can't smoke. 1. use JR Sobu Line to Nishi-Funabashi. 2. use Tozai Line to Urayasu. There is Yagura stage and local Wadaiko team (Japanese drums) join and play drum for Bon Odori Song. The dance platform is very huge and many people can dance at the same time. Out side of the school, there are many food stands.